The tune, Buchal an Eire is a traditional Irish air. The lyrics are by Loreena McKennitt (above). 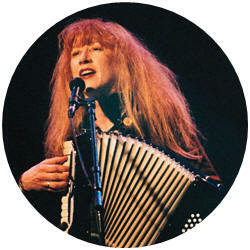 The daughter of a nurse mother and a livestock trader father, songstress Loreena McKennitt studied classical piano and vocal training and learned to dance in the highland style as a youngster. Her love of traditional music was strengthened in the folk clubs of Winnipeg, which she frequented during the brief period she studied veterinary science at the University of Manitoba. Relocating to Stratford, Ontario, she continued to sharpen her skills as a composer and performer. Oh, come by the hills to the land where fancy is free. Ah, the cares of tomorrow can wait till this day is done. Oh, come by the hills to the land where life is a song. Ah, the cares of tomorrow can wait till this day is done. Oh, come by the hills to the land where legend remains.